The ZW550-6 leads off the new Dash-6 series of Hitachi wheel loaders. Weighing in at 104,000 lbs. (47,173 kg) and 512 hp, and equipped with an 8.2 or 9 cu. yd. (6.2 or 6.8 cu m) bucket, it’s a robust piece of production machinery built for the heaviest applications. With the release of the ZW550-6 loader, Hitachi Construction Machinery Loader America Inc. (HCMA) has established a flagship machine worthy of the firm's goal of delivering on the needs of America's most demanding buyers of heavy equipment. The ZW550-6 makes a strong case for earthmoving contractors and quarry operators to include Hitachi on their "must see" list when they are looking for a big, dependable machine. The ZW550-6 leads off the new Dash-6 series of Hitachi wheel loaders. Weighing in at 104,000 lbs. (47,173 kg) and 512 hp, and equipped with an 8.2 or 9 cu. yd. (6.2 or 6.8 cu m) bucket, it's a robust piece of production machinery built for the heaviest applications. With its standard Dual Z-Bar linkage, high tipping load, and high breakout force, Hitachi designers had clearly set their sights on tough rock handling as well as loading high volumes of soil and fill, according to the manufacturer. To meet the expectations of demanding buyers, Hitachi steps up with a full suite of premium features for the ZW550-6, including joystick steering as standard along with smart technology such as traction control, ride control, auto power-up, and an operator-friendly LCD color monitor. Hitachi's "Global e-Service" telematics and ConSite reporting, now available in the wheel loader line-up, provides 24/7 remote monitoring, daily maintenance and operational data plus monthly performance reports. Dash-6 machines also take the lead in Tier IV Final power, replacing DPF filters with clean SCR technology using a simple DEF system. The ZW550-6's heavy duty box frame is built for the long haul in tough environments. The durable frame is matched with a low-mount lift arm that minimizes twisting on the front frame, especially with uneven loading. The cooling package is equally suited for long duty cycles in hot, dusty applications. A reversible cooling fan comes as standard with automatic or manual activation. Aluminum cooling cores ensure high cooling efficiency as well as longer, corrosion-free service life. A protective rear grille also helps to prevent dust and raw material from entering the radiator compartment. A new Power Mode feature provides simple access to extra power on demand for higher productivity and efficient duty cycles. The quick power switch, mounted conveniently on the steering joystick, lets operators boost power instantly with a 10 percent higher engine rpm. The power boost means added rim-pull and breakout force for digging into heavy piles or for climbing grades with a full load on board. Power Mode also provides faster hydraulic speed for quicker bucket lifts. While Power Mode also allows faster acceleration on flat stretches, it does not limit the loader's top speed. It means faster duty cycles with more payload each time. 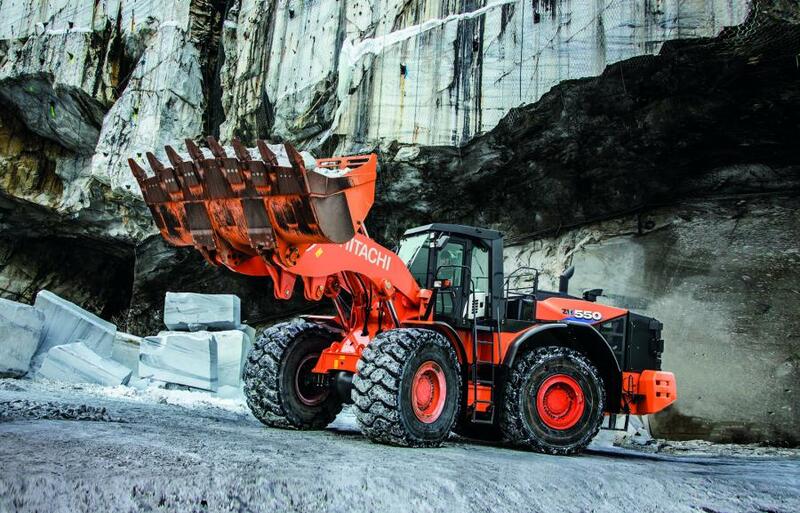 Loading tasks are further simplified with the Hitachi's ZW-550-6 responsive lift/bucket prioritization. Its Parallel Tilt & Lift movement smooths out digging operations while the tandem function prioritizes the bucket when dumping. Then the automatic return-to-dig function resets the bucket for the next load. Hitachi claims the best cab visibility in the business for loader operators, with clean lines of sight in all directions, according to the manufacturer. With standard joystick steering, there's no steering wheel to obstruct the operator's view of the work zone. Hitachi also opens up the view to the rear by relocating the exhaust stack to the far end of the rear cowling. Sight lines are further enhanced by the ROPS design, with frame struts forward and away from the corners of the cab. A rear safety camera is standard equipment. Proximity detection provides audible and visual alerts for stationary and moving objects out to 20 ft. from the loader. By eliminating DPF and its attendant regen cycles from the ZW550-6 power system, Hitachi delivers a Tier IV solution for wheel loaders that simplifies servicing and saves fuel. The new ZW550-6 introduces a clean SCR system that runs efficiently without high engine temperatures, reducing needless fuel consumption and removing any concerns about idle times. With no DPF system, operators can look forward to less downtime for engine maintenance and extended engine life. The SCR opens space in the engine compartment, giving service techs easier access to service points. An auto shutdown feature adds more savings on fuel and emissions. Telematics with Hitachi's Global e-Service allows ZW550‑6 owners to monitor their loaders remotely for machine performance, receive daily operational reports, perform remote diagnosis and plan for maintenance dates. The results also are provided automatically in monthly email summaries, with Hitachi's ConSite program. For more information, visit www.hitachiwheelloaders.us.